Located just south of Quito, (the capital of Ecuador), close to the village of Aloag, the Hacienda La Alegria is ideally situated for riding vacations on the lower slopes of Volcan Corazon (4788m) in the heart of the "Avenue of the Volcanoes", a spectacular valley dividing the eastern and western ranges of the Andes. From the garden of the hacienda you can enjoy breathtaking views across the valley to the extinct volcanoes of Ruminahui, Pasochoa, Atacazo, and in the distance the mighty cone of Cotopaxi, the highest active volcano in the world. Your host Gabriel comes from a long tradition of equestrian sports. His grandfather bred race horses close to Quito, while his father, Renato Espinosa was a keen polo player. Gabriel followed in the same footsteps as a young man, horse-jumping and playing competitive polo. Gabriel and Paty's three daughters are all keen riders, and the enthusiasm of the whole family is reflected in the quality of the horses at the farm. 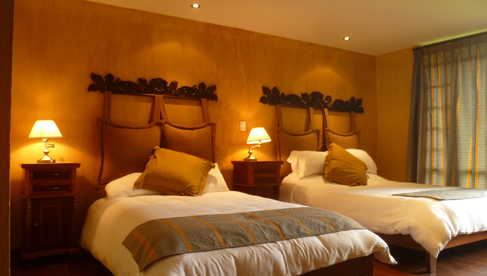 Hacienda La Alegria is situated in the verdant valley of Machachi, to the south of Quito. Surrounded by eleven volcanoes, this region is often referred to as “The Volcano Avenue”. 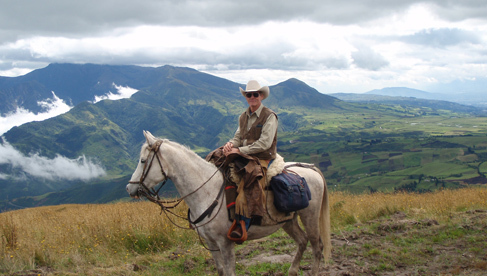 Most of the horses for these Ecuador riding vacations have been bred on the family farm and include mixed Criollo (native South American), English Thoroughbred and Arabian stock, resulting in a near perfect combination of toughness, agility, calm temperament and "mountain sense". Beginners and experienced riders alike have found them easy to ride, willing and good mannered. If you have previous riding experience you will be given plenty of opportunity to canter. 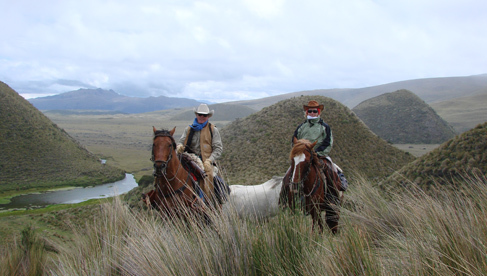 There is a range of tack for these Ecuador riding vacations including Western style, English style, Mclellan calvary, Chillean and traditional Ecuadorian "Chagra" style, with its intricate leather-work and saddle horn. There are rides with fixed itineraries which allows you to meet other like-minded travelers and enjoy the experience of a lifetime in great company. For groups of two or more, customized rides can be arranged. Learn more and see rates and details. 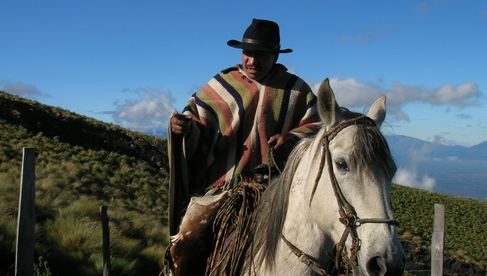 This Ecuador riding vacation is for 2 to 12 riders. This trip will give you the opportunity to visit the unique cloud forest ecosystem in the middle of the Ecuadorian Andes. Perfect for adventure seekers, intermediate riders, advanced riders with little time and beginners looking for a longer ride. 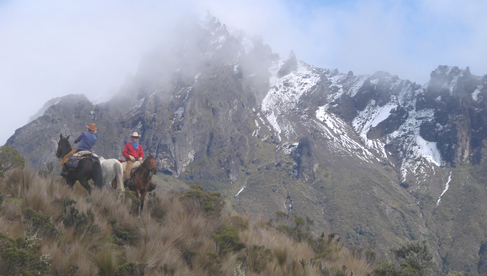 This riding tour brings us new experiences and a chance to contemplate the beauty of the mountains and valleys of the Ecuadorian Highlands everyday. 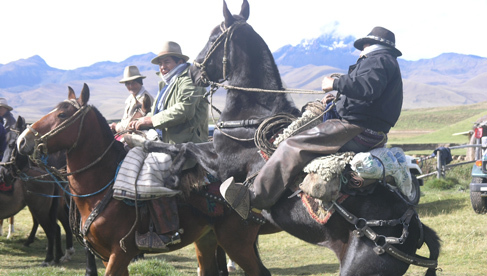 As we ride, friendly chagras (cowboys of the Ecuadorian Andes) will guide our way and share with us their lifestyle, traditions and impressive horsemanship skills. Our ride includes rides by Corazon, Illinizas and Quilotoa volcanoes. It is the perfect combination for those looking for adventure, cultural immersion and natural beauty. 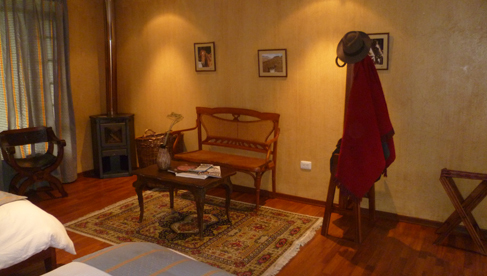 Hacienda La Alegria is located south of Quito in the verdant valley of Machachi. As it is surrounded by eleven volcanoes, this region is referred to as “The Volcano Avenue”. Uniquely, the only form of transportation during your trip will be your horse. They will be your partner throughout this adventure. We will thoroughly explore and experience the grandeur of the Andes, from the west to the east mountain chain, marvelling at the diversity of flora, fauna, and landscape. And, of course, you will have the opportunity to admire the majestic Cotopaxi, the highest active volcano on earth. The Around Cotopaxi + Chagra's Parade Ride is offered once a year in July when the town of Machachi has its annual Parade. It is a 9 day ride which follows the Volcano Ride itinerary, but includes an extra day for the Chagra Parade. 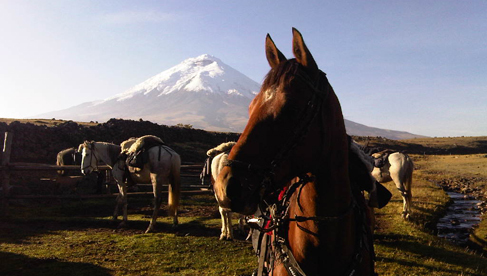 This Parade is a commemoration of Cotopaxi`s last eruption and about 2000 Chagras participate by horse. This ride is specifically designed forthose looking for a cultural immersion and adventure. The Ecuadorian Andes run north to south and are comprised of eastern and western chains. Hacienda La Alegria is at the western chain. 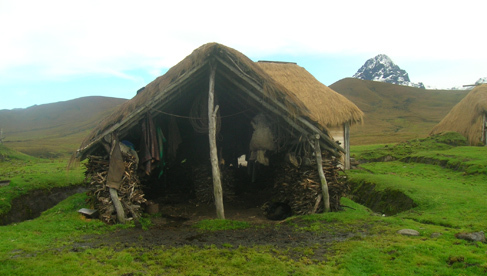 The southwestern Andes are a well known Indian region, isolated communities like, Quilotoa, Sigchos and Guambaine are also found in the middle of the Andes, following the same traditions and ways of life since the Colonial times. 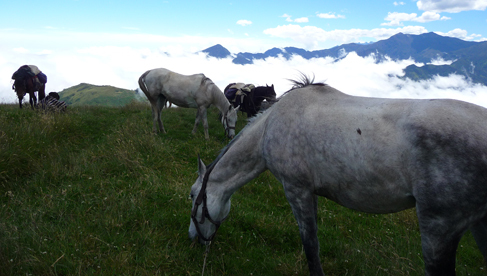 This horseback riding vacation is specifically designed for those looking for cultural immersion and adventure with long journeys and amazing scenery. The route takes us close to the Illinizas, Quilotoa, Chimborazo, Carihuirazo, Igualata and Tungurahua volcanoes, the last of which has been active for the last 19 years. During the ride we also have the opportunity to enjoy two thermal springs. Over the first days, riders will have the opportunity to acclimatize to the altitude, weather and new environment. Riders will get to know the horses well and start a relationship with them, as they will be part of the team for the rest of the ride. 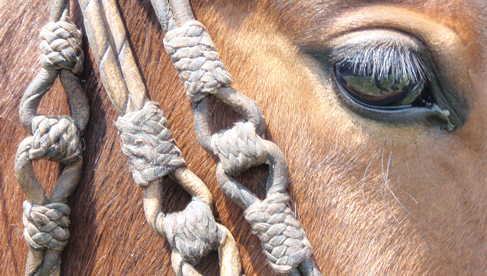 They will have the opportunity to try a variety of horses with different temperaments and traits; together we will choose which group of horses will accompany us, we will have several spare horses on the ride. and powerful showers. One suite is also available. 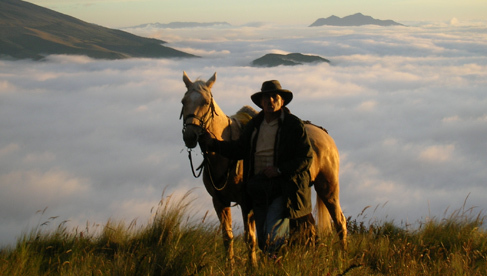 The family and staff for these Ecuador riding holidays provide full board including all meals that are tailored for hungry travelers, riders and hikers, and combine delicious Ecuadorian and international cuisine. Breakfast includes coffee, tea, cocoa, oatmeal, eggs and/or French toast, natural fruit juice, and fruit of the season. Dinners are typically Ecuadorian soup, chicken, beef, pork or pasta, vegetables, rice or potatoes, and dessert. Lunches on trail days are high energy pack lunch (sandwiches, fruit, candy). Hacienda days include meals similar to dinner. Vegetarian / other special dietary options on request. 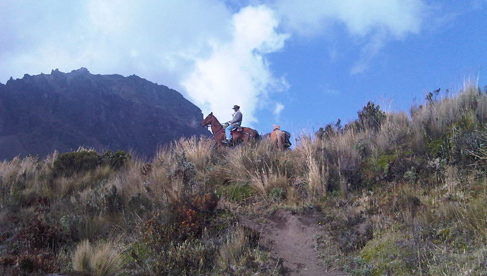 Ecuador's Volcanoes and Haciendas is dedicated to low impact tourism. A variety of activities are available for those interested the ecology of this immensely bio-diverse region. 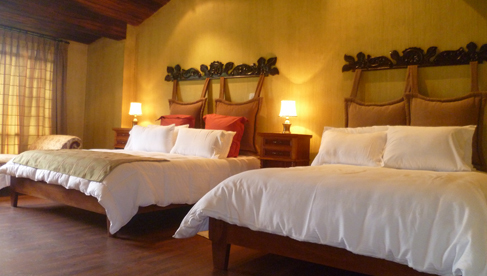 Visit the Hacienda's website for dates, rates and to book this trip.